There are lots of things to consider as the end of the year approaches. Consumer activity spikes throughout the holidays, as does activity on social media platforms, and young people all over Australia are making decisions about their future with their final exam results coming in. It is therefore extremely important to have a refined social media marketing plan for this period to ensure your messaging is effective in the limited time you have in an already oversaturated space. The Year13 team are no strangers to these demands and instead see it as an exciting challenge to maximise engagement in the final sprint to the end of the year. Here’s our tips to help you do the same. It goes without saying that you should be planning your social posts with key holiday dates in mind, but there are several other dates during this time that are just as important for school leavers and other young people. While businesses will ramp up their marketing efforts in the lead up to Christmas, it’s wise to leave the actual day free of any explicit advertising. Instead, focus on the dates when ATAR results and university offers are released. Students will be experiencing a whole range of emotions in response to these – both negative and positive – and validating these will be a great way to market your opportunities. Using external scheduling tools like Hootsuite or the inbuilt platform functionalities for posting are useful all year long, but it becomes even more of a necessity in the holiday period if you have extended time out of office or simply want to stay on top of your workload in this busy time. Just because your office is closed doesn’t mean your social media strategy can also take a break so utilise these tools to ensure quality content continues to go live over the holiday period. The consistency of our social media marketing shouldn’t drop off just because it’s the holiday period, but we also know it can be difficult to maintain the output with reduced work hours. This is why we use this time to curate content as well as creating it, as this helps us fill our posting schedule more easily. In 2017 we ran a ‘best of’ series that rounded up the top articles of the year. 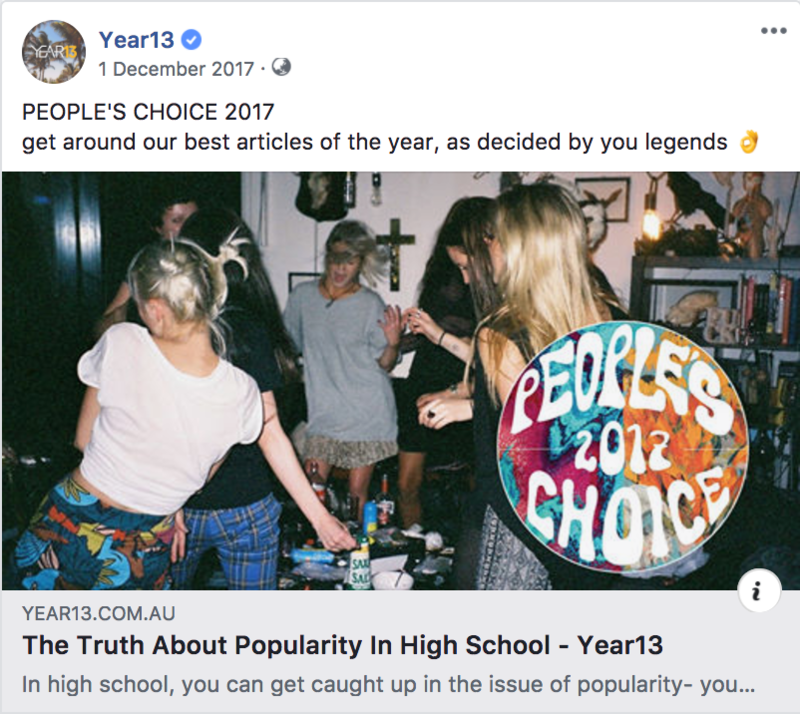 We called it the People’s Choice and it was a great way for us to reuse the highest performing content pieces while letting our audience have a sense of interactivity with our platform. Our account managers don’t want to be checking how ads are performing while on holiday, nor do they want to be thinking about it during Christmas lunch, so during this period we rely more heavily on the inbuilt features of the Ads Manager. On Facebook we can set rules such as for an ad to switch off if the CPC or CPM exceeds a certain limit; during a normal work week we’ll be checking this manually and tweaking as we go, but having an automated rule means we don’t have to worry about wasting our budget on a weak ad while we’re away from our desk for any period of time. Apart from the challenges that arise from this unique time of year, we should also consider the challenges associated with engaging our key market – Gen Z. We know from their consumer behaviour that they respond well to social media while being more resistant to advertising in general compared to other generations. This points to the need for effective storytelling to cut through to them, especially during this reflective period of the year when they’re receiving exam results and thinking about their future. Storytelling will allow young people to identify with your marketing more easily. It’s a natural way for them to consume media and if done well, can be used to influence their decision-making process for further study, employment, or travel. If you’re looking for help with your youth engagement strategy this holiday period or beyond, contact us or download our latest Media Kit for more information.